We’ve been busy. We had an out break of Hand Foot and Mouth disease. That was not fun. One had it and two more got in. Thankfully only three got it. If you don’t know a lot about it, let me just say, it’s nasty. Google “hand foot and mouth” and you’ll see what it’s like. It starts with a fever and then goes to sores all over hands feet and mouth. Some even had it all over their bottom. The sick kiddos had to stay home so there were a few days I didn’t have many kids. We had a week of rainy weather so I pulled out the craft ideas again. In summer we don’t to crafts everyday as so much of our time is spent outside. 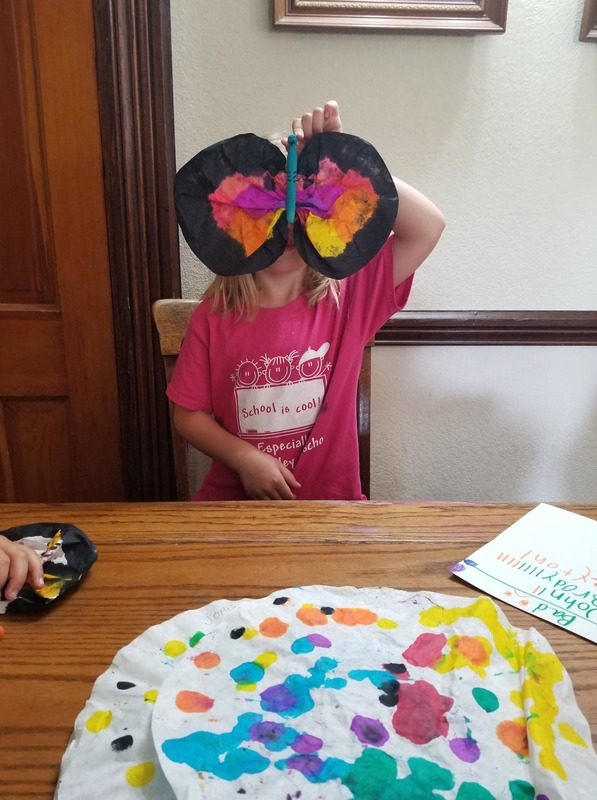 Here’s a simple butterfly craft they did. 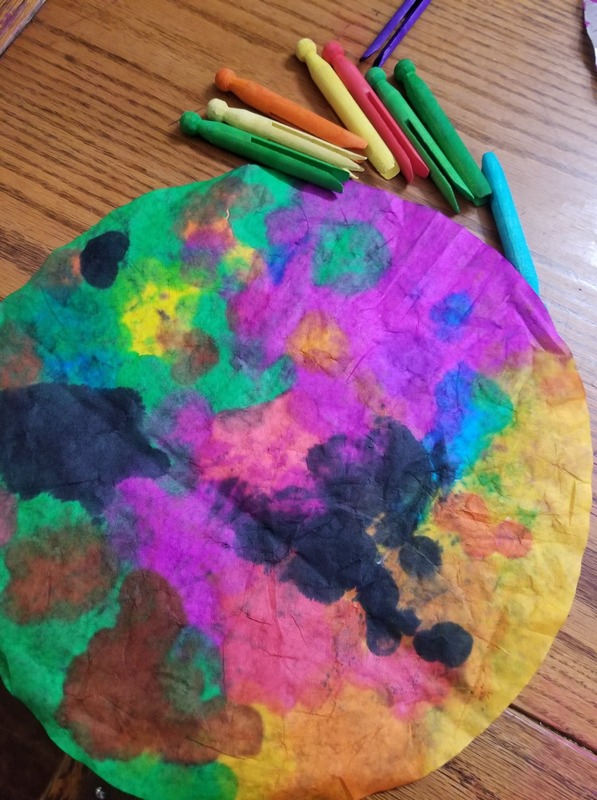 Color an extra large coffee filter with dot markers. Even little ones can do this. They can look like this. Let them dry. With the older kids we talked about symmetry. You can see one done by the older kids here. After the filter is dry we scrunched it together and slid the filter into an old fashion clothes pin without the spring. Something else we did that fascinated the kiddos was using a pepper grinder. See the picture below. I had a couple sets of salt and pepper shakers on the counter and had plans to tag them to take to our antique booth in Harmony. 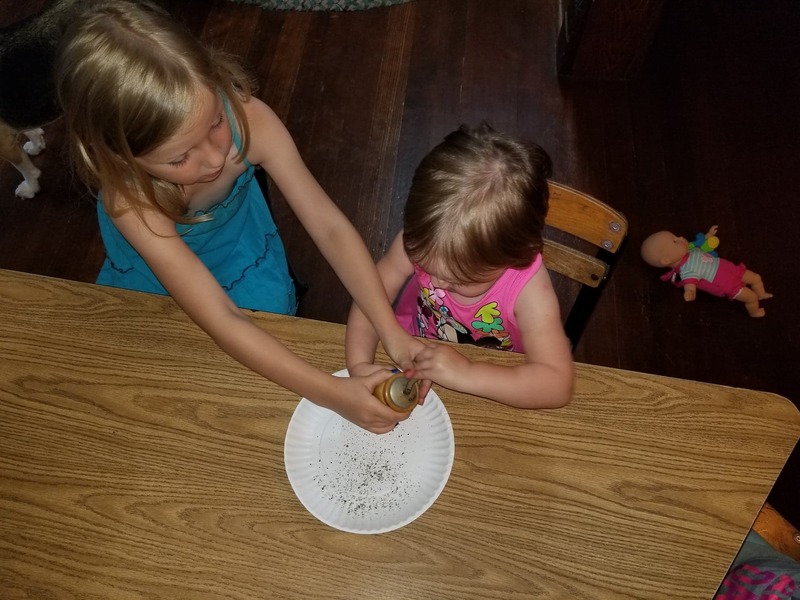 The kids saw them and couldn’t figure out what the pepper grinder was or how it worked…so we tried it out and the kids ground pepper. Not a typical childcare activity but I really like to work with the ideas that they bring to me. If they are curious, why not feed the curiosity? 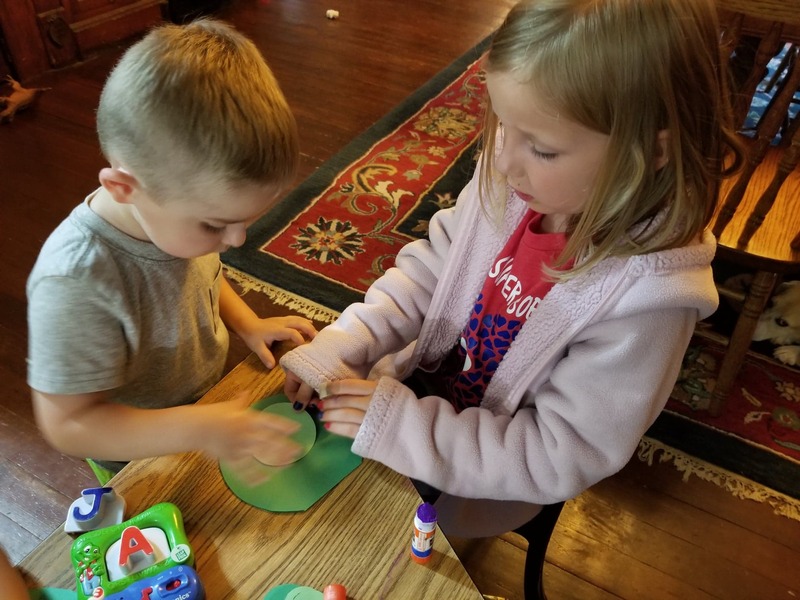 It’s been nice to have some bigger kid hands around to help the little ones at craft time. This day the neighbors had their skid loader out. 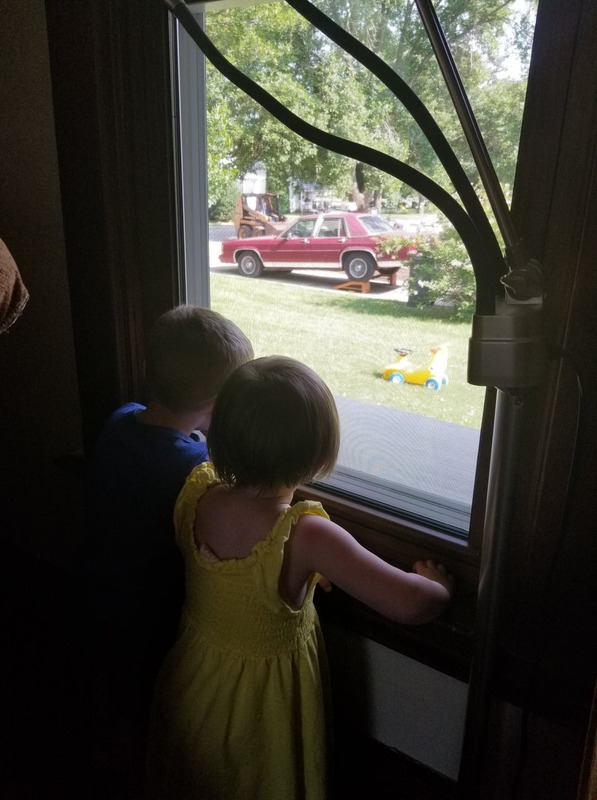 The kids had fun watching them. I am trying to keep my school agers from losing everything they learned over summer. 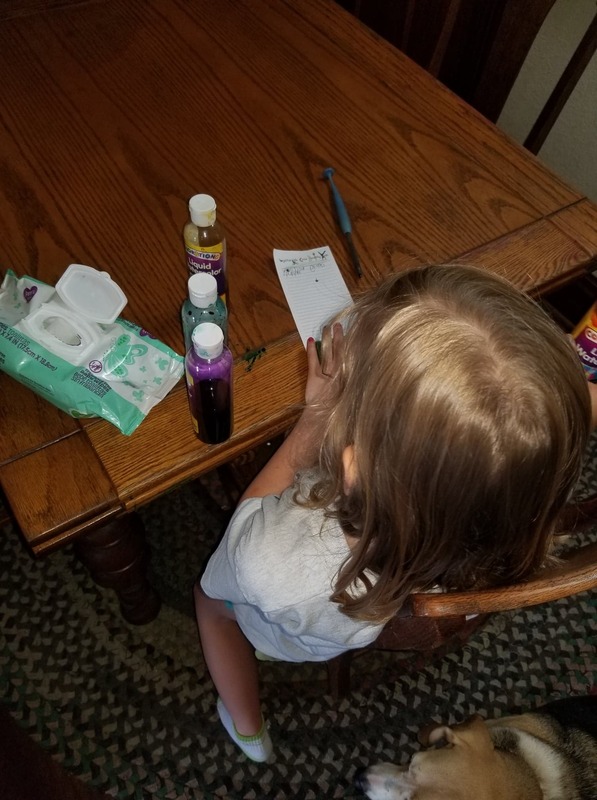 Here I have one writing down the colors of paint we need to order. 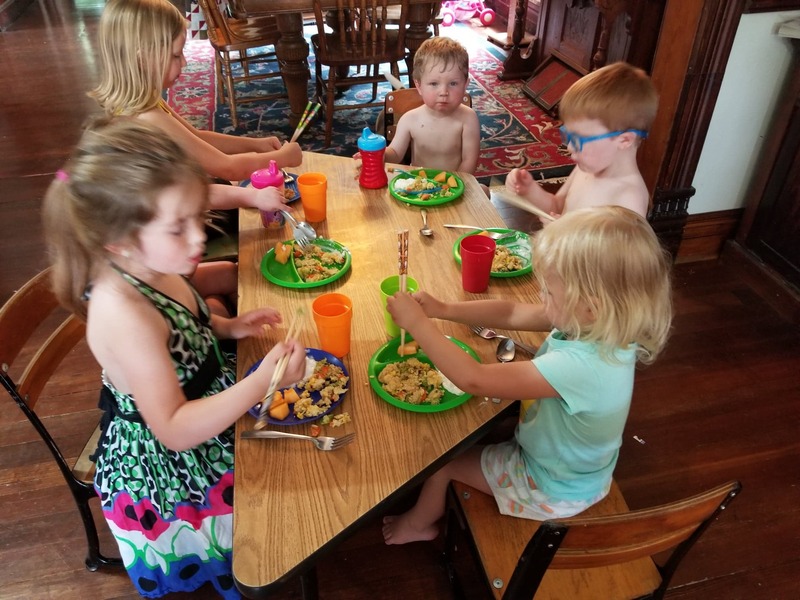 I made fried rice with chicken and then gave the kids chop sticks to eat with…not Carver, of course, but the kids 3 years old and up got them. They thought it was pretty cool. One thing I do to make it easier is to rubber band the end of the chopsticks where they hold it together. They love this. Along with the fried rice with chicken in it I also gave them cantaloupe. It’s was easy to pick up the cantaloupe so they all felt successful. We’ve spent lots of time outdoors. Water is the main attraction…along with the swing and sandbox. Last year at the thrift store I bought a file system on wheels. 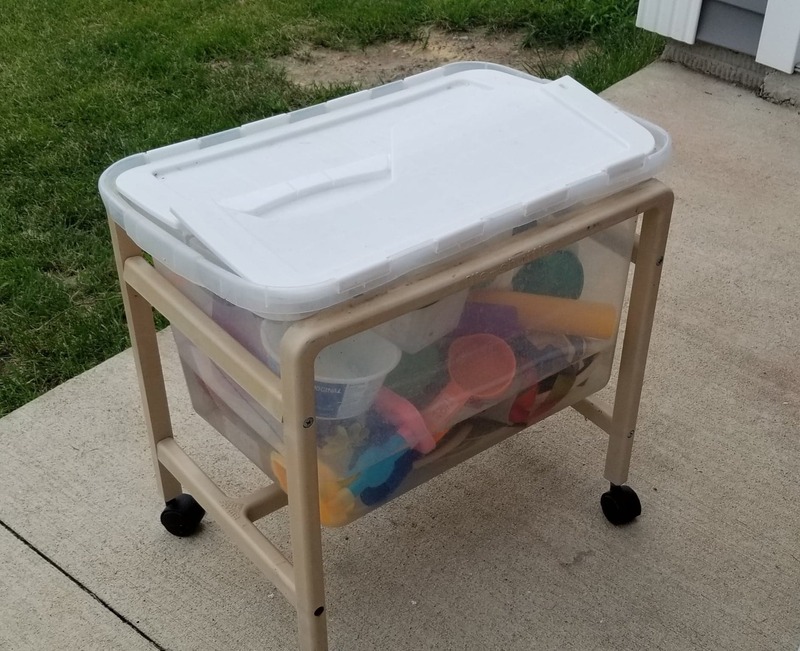 I took it outside and I use it as a water play spot of the kids. I filled it with water and it worked awesome. Then in the fall I left it outside a little too long and there was a crust of ice on it. I broke the ice and then tipped it out but the whole thing slipped and the tub that held the water broke. I was so frustrated. I went to the computer to check to see how much a new one would cost….ugh. $60. I threw out the tote and kept the frame hoping I’d be able to find a replacement box. Then I realized a tote might fit in it. So off to town I went and found a tote perfect for it. See? We LOVE this for water. It’s tall enough that it’s safe for the littlest kiddos. It’s chest high on them. They can’t get in it and drown. It’s always a fear of mine around water. One thing I’ve come to do now that I’m older is appreciate the little things. Watching kids discover simply amazes me. This little guy was big into watering. 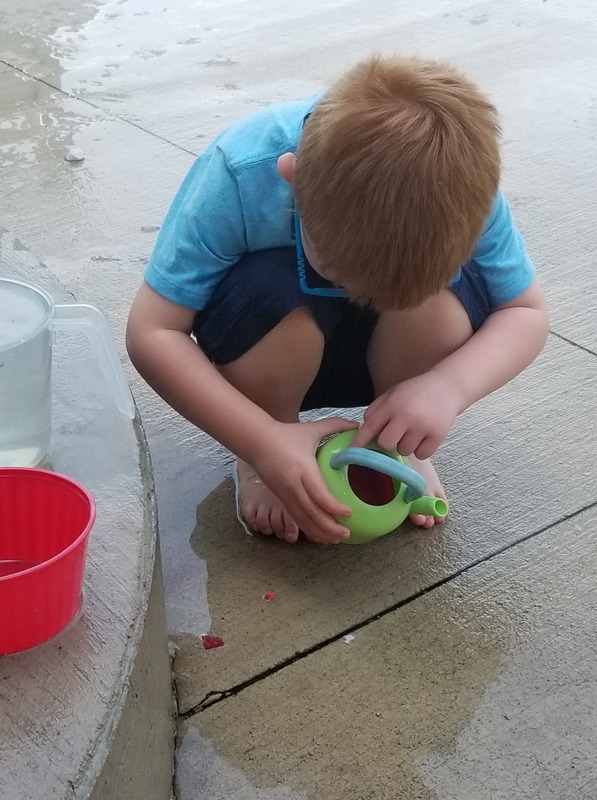 He had the small coffee pot…then a houseplant water can…then he put a plastic tube over the spout of the water can to test how it all would work. 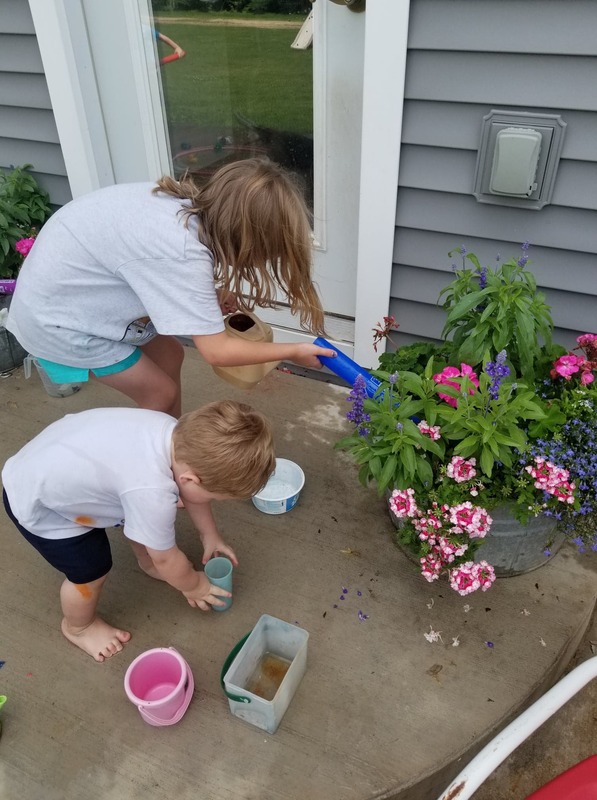 Pretty soon he had his sister putting water into the tube to water my plants. They wanted to get the water “way” in there. 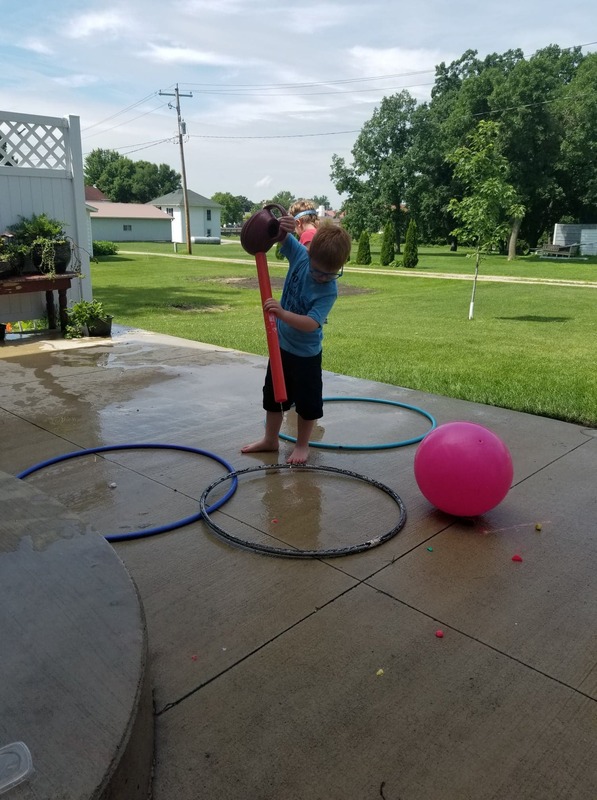 She discovered that she had to lift the tube up at an angle or the water wouldn’t flow into the plant. It was so fun watching them!! I wish I had taken more time with my own kids to see more of these “discoveries”. In days past I got all bothered about the kids playing in water and getting their clothes all wet. Now days I don’t at all. I let them get wet then bring them in and throw their clothes in the dryer. The little ones are the only ones who are wet. I let them run around in a diaper for 20 minutes while their clothes dry. No stress at all…that is unless I can’t remember which boy wore which shorts!! With so many the same size it’s a real problem. We had lots of rainy inside days. I have one that is infatuated with ballet and ballerinas. 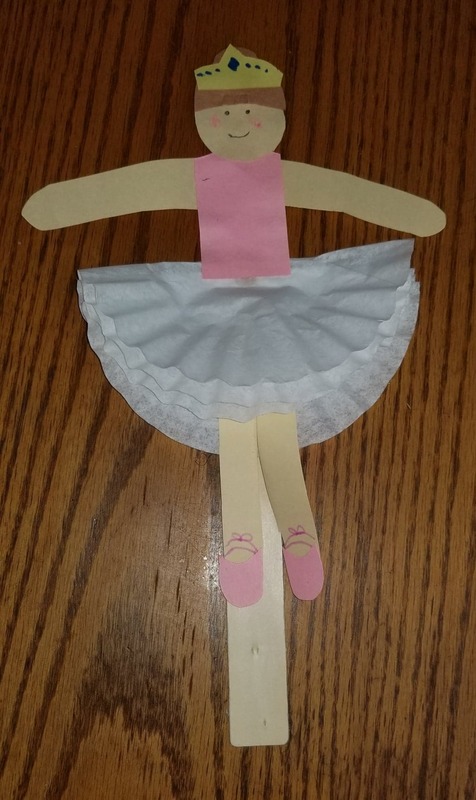 We ended up making this ballerinas out of a paint stick, cupcake liners and construction paper. I just made the craft up. The kids liked them a lot. Then they up the puppet theater curtain I made and put on puppet shows. I sat through several shows clapping and yelling bravo at the appropriate times. Someone once told me when doing childcare, I don’t have to have brilliant things that a preschool class has. I don’t have to have the fanciest snacks or most expensive toys. I need to be present and give the kids a safe place to be. The rest will handle itself. That has been good advice. I used to always be so uptight trying to make everything perfect. I’m not that way anymore. I’m so glad. I’m more relaxed and that shows in the kids. So all this ballet leads to learning things I never knew before. 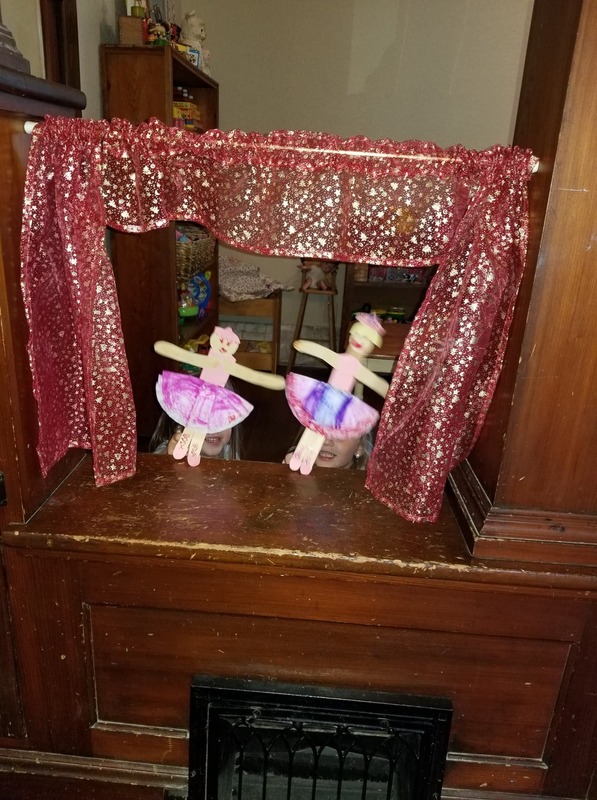 If you ever stop by and wonder what’s up…yep that’s me learning a few ballet positions via youtube so I can show them to the kids. Oh…it’s all fun right? I feel so silly but this little one loves anything I read to her or show her…so I do it. …and that’s the latest in the Childcare Chronicles. This entry was posted in childcare, Uncategorized on July 3, 2018 by Jo. Just a thought, snap a pic of the kiddo’s before you put their clothes in the dryer…then you know whose is who. Jackie, that was my thought also! Great job Jo ! You’re making memories for your kiddos and you! I worked at a preschool and the teacher’s belief was learn through play. And it’s so true! Her other mottoe was it was about the process not the project-we didn’t make models of things for them to make. We just gave them the materials, told them what to do and let them go at it. The exception was holidays when we made gifts. It was the best job ever! What lucky kids to be blessed to have you in their lives! I wish every child in daycare could have the kind of care you provide. I used to be the same way with my kids when they were little, but I’m a lot more calmed down with my grandkids. I think we just get mellowed out with age. Kind of like a fine wine lol. There is no way I would have let my kids get by with what I let the grand’s and their friends get by with. my entire sympathy to the kiddos with Hand and Mouth disease. My daughter and I had it when she was 11 months old and it was AWFUL. Very painful. So much fun watching kids learn! Hand, Foot and Mouth disease must be going around because all I typed in my search engine was “han” and it popped up first on the list! Poor babies!!! Looks horrible. Your little ones exploring the world around them in a safe place is the best thing for them at their age. Preschools with their structure and schedule, no matter how good, just can’t compare!! Plus, at your house they get love!